Description: Accusations, mistaken identities, and romances run wild in this traditional, laugh-out-loud farce by Tom Smith. 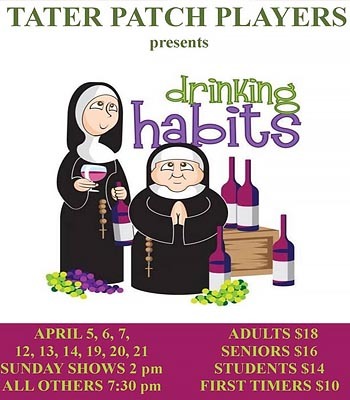 Two nuns at the Sisters of Perpetual Sewing have been secretly making wine to keep the convent's doors open, but Paul and Sally, reporters and former fiancees, are hot on their trail. They go undercover as a nun and a priest, meet a new mysterious nun, and the three of them spread paranoia throughout the convent. Spies from Rome? Wine and secrets are inevitably spilled as everyone tries to preserve the convent (and reconnect with lost loves). Tickets are $18 for adults, $16 for seniors, $14 for students and $10 for First Timers. We make every effort to ensure our information is accurate. The site is supported by third party advertising and KnowPickens.com doesn't endorse or assume any liability for their products or services. If you find errors or would like your information removed, please email info@knowpickens.com.